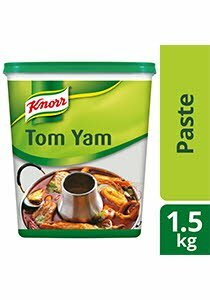 The ingredients of Knorr Tom Yam Paste are carefully selected for the authentic Thai Tom Yam aroma and taste, suitable for Tom Yam soup and spicy dishes. Palm olein, salt, sugar, chili, monosodium glutamate, garlic, citric acid, lemon leaf, palm fat, lemon grass, onion, maltodextrin, lemon juice, contains permitted flavourings, yeast extract, sodium inosinate and guanylate, spices, contains permitted colouring. Produced with the same equipment with product contain shrimp, egg, milk, soybean and gluten.